Well.......... winter is definitely here! 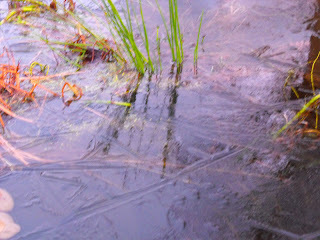 I woke up the other morning to find the garden pond frozen all the way across. The ice was no more than 4 or 5mm thick and I was rather worried when Maggie (one of our cats) thought it might be interesting to walk on. I managed to persuade her that it was a bit foolhardy. As I drove out to the studio I saw there was snow on the mountains - not just the tops, but down to quite a low level. The temperature, according to the car thermometer was 2°C. Once I arrived at the studio it felt more like -20°! I switched the heating on right away, but it took a good couple of hours to warm up and I spent the morning do things that involved moving around rather than sitting still. 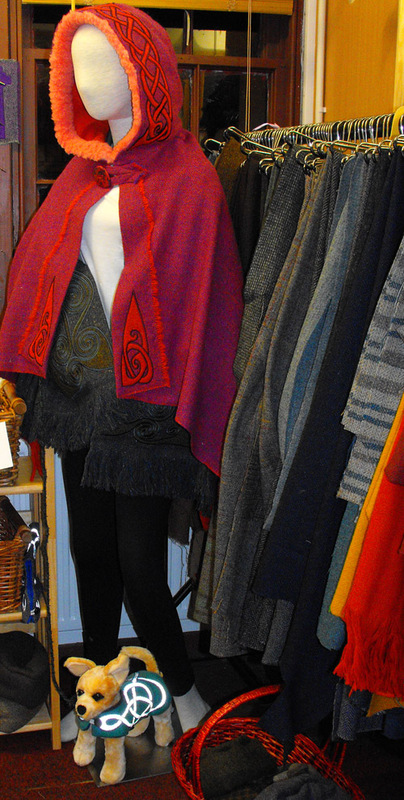 Earlier in the week Mary and I had spent some time rearranging the shop area. 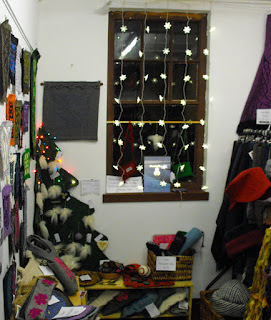 Now that all our craft fairs are over, we no longer need to keep packing and unpacking our stock. The shop is well stocked and open for business. And to make things easier for our customers, we now have facility to accept credit and debit cards. In the shop you will find almost all of our range. There were a few things that we sold out of at the various craft fairs. Our corset belts are all sold but we hope to make some more over the next few days. And we only have one of the tweed-buckle belts left - more to follow soon! The mannequin looked cold so we decided she could have both a wrap and a Hebridean hood. Here you see her standing beside a rail of some of our tweeds - so if you don't see the colour you want in the things that are already made, you can choose your own tweed and we will make it up for you. At the moment we can still get things made in time for Christmas but put your orders in as soon as possible. On the agenda for this week is making some of our muff purses - but we are going to try lining them with real sheepskin rather than synthetic fur fabric. It will put the price up, but they will be much cozier and more luxurious - so.. watch this space! In the meantime, all our other products are available - either by shopping in person or through the on-line shop. We have bags & purses, hats and scarves, wraps and hoods, wallhangings and cushions, Christmas decorations and various other bits and pieces. 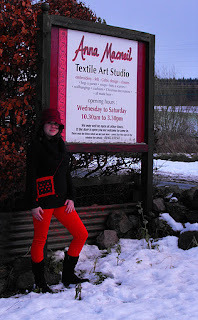 If you are looking for a present for a creative person, why not get them one of our vouchers for feltmaking classes? These are available in multiples of £10 and classes can be arranged at a time to suit the recipient. We give the vouchers in small hand-made felt envelopes and these can be used afterwards as a glasses case - so a very practical present. See the website for more details. We should be open 6 days a week up till and including 23rd December, but then we will close the studio for the Christmas holidays. We will definitely be there between 10.30 and 3.30 each day, but usually I am there between 9.30 and 5.30. However, if you are travelling a distance it is worth phoning just to check. Real snow! 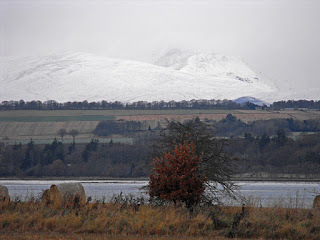 The weather is fairly changeable just now - nice sunny days interspersed with wild storms some days and snow on others. We had planned to spend last Thursday taking photographs for next year's catalogue but the horizontal sleet made it impossible. This photograph was taken on the Tuesday.